Home / Family Life / The Habit! Check out the new Chicken Sandwich! The Habit! Check out the new Chicken Sandwich! For the first time ever, Habit Restaurants, Inc. is introducing a Golden Chicken Sandwich nationwide. The Golden Chicken Sandwich is the perfect addition to The Habit menu that is known for its variety, quality and value. This Golden Chicken Sandwich ($6.25) starts with a fresh, filleted chicken breast that is hand-dipped into house-made seasoned flour and buttermilk, not just once but twice, before being fried to perfection and custom made to order. This extra care gives the Golden Chicken a crunchy, flavorful crust while keeping all the juiciness. 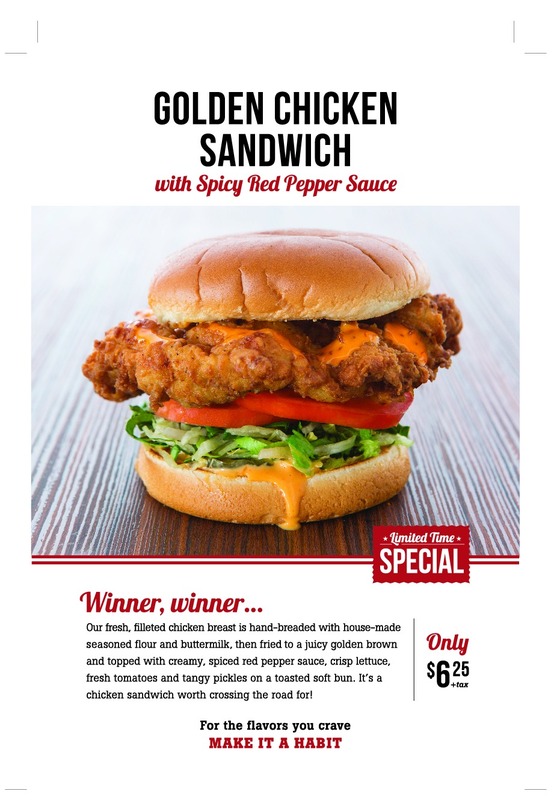 The Golden Chicken Sandwich is topped with a new spicy red pepper sauce and served with fresh sliced tomato, lettuce and tangy pickles on a soft toasted bun. “Better burgers are truly just the start at The Habit, and this new Golden Chicken Sandwich complements our overall menu of high quality, deliciously custom-crafted food and gives guests another favorite item to enjoy at The Habit,” said Adam Baird, executive chef at The Habit Burger Grill. The Habit Burger Grill is a burger-centric, fast casual restaurant concept that specializes in preparing fresh, made-to-order chargrilled burgers and sandwiches featuring USDA choice tri-tip steak, grilled chicken and sushi-grade albacore tuna cooked over an open flame. In addition, it features fresh made-to-order salads and an appealing selection of sides, shakes and malts. The Habit was named the “best tasting burger in America” in July 2014 in a comprehensive survey conducted by one of America’s leading consumer magazines. The first Habit Burger Grill opened in Santa Barbara, California in 1969 and has since grown to more than 160 restaurants in 16 markets throughout California, Arizona, Florida, Idaho, Maryland, Nevada, New Jersey, Utah, Virginia and Washington. More information is available at www.habitburger.com. Previous post: JORD bring the Best in Fall Fashion with Wood Watches!